The three Drane brothers who enlisted to serve in the Australian Imperial Force during World War 1 were sons of Priscilla (née Griffith) and John William Constantine Drane who lived at Mundumburrah in Drane Street, Clayfield. Their mother was Mrs Priscilla Drane (known as Prissie), daughter of the Revd Edward Griffith and sister of Sir Samuel Griffith. She died in 1900 at the early age of 40 years leaving her husband John and their five sons, the eldest then 16 years old and the youngest only three. Their father John William Constantine Drane was an Accountant in the Education Department. He died in 1928. Of the five sons, two did not go to the war. The eldest, William Griffith Drane was born in 1884, became a Staff Surveyor and died as a result of a poisoned leg at Roma Hospital in August 1919; and at the same time, another brother, Edward Dudley Drane, an Accountant, died in Brisbane. The stories of the three soldier sons are recorded on this website. 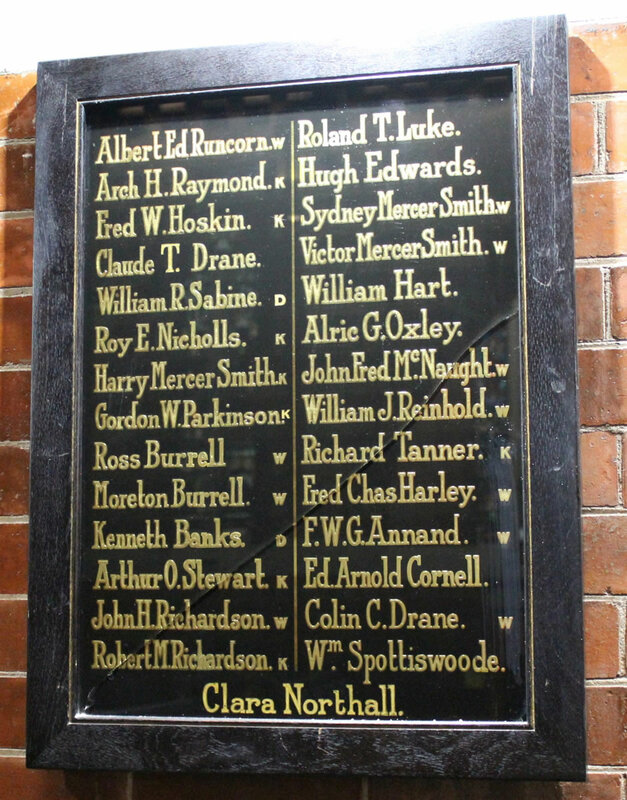 Their names are on the honour board from the Wharf Street Congregational Church where their grandfather was Minister from 1860 till 1889. Claude Thompson Drane was born at Clayfield, Brisbane on 14 March 1886, the second son of John William Constantine Drane (Accountant) and Priscilla née Griffith. He attended Brisbane Grammar School from February 1900 to April 1902. His mother died during his first year there when he was 14 years of age. He had left home by the year 1908 to work as a Clerk at the Darling Downs town of Jondaryan. On 29 August 1914, shortly after the outbreak of war, he enlisted at Sydney, New South Wales to serve overseas in the Australian Imperial Force. He was a tall man, six feet (182.9 cm) in height, 28 years and five months old, of dark complexion, brown eyes and hair. His father was named next-of-kin and his religious denomination was Congregational. He was allotted to the 1st Field Artillery Brigade with service number 648 and rank, Gunner. His unit embarked from Sydney on board HMAT Argyllshire on 18 October 1914, bound for Alexandria, Egypt. Field Artillery brigades, formed for infantry divisions, were equipped with 18 pounder field guns. Based at Mex Camp, Alexandria, Gunner Claude Drane trained with other Australian soldiers also encountering a completely different culture for the first time. He served at Gallipoli from the landing in April 1915 but was admitted to hospitals in Alexandria at Zaherich Camp and Mustapha Camp towards the end of the year 1915 with a contused foot. He was discharged from the Australian Convalescent Depot for normal duties on 29 November 1915. Gunner Drane’s unit proceeded to France via Marseilles at the beginning of April 1916 and was transferred to 3rd Field Artillery Brigade on 16 June. This artillery brigade and others supported the Australian Army Corps on the battlefields of France and Belgium, in all Somme and Passchendaele engagements and at Messines. At the end of November 1917, Gunner Claude Drane was admitted to hospital in Le Havre, France where he remained for a total period of 36 days. He was transferred to England then returned to Australia per RMS Kenilworth Castle and discharged on 1 July 1918, being unfit for active service because of his injured foot. Claude Thompson Drane married Elva Agnes Slingsby Steel on 3 October 1923 at Targinnie near Gladstone. The couple had a child and were engaged in fruit farming at Targinnie in 1925. They later moved to Rabaul on the island of New Britain where Claude Drane was Manager of the Vacuum Oil Company. The Territory of New Guinea was then an Australian administered territory and many Australian civilians from all walks of life, administration officers, school teachers, planters, missionaries and traders settled there; and many, including Claude Drane had seen prior service in World War 1. Prior to the occupation of the Territory of New Guinea by the Japanese in World War 2 when Rabaul became a major Japanese base, Australian women and children were evacuated, but the men had to remain at their places of employment in the New Guinea islands. When the Japanese invaded the town, Claude Drane went to secure the company’s books but was not seen again. Civilians and hundreds of Australian soldiers were captured by the Japanese. Mrs Elva Drane (Tip) escaped on MV Neptuna and moved to Sydney and was living in the Sydney suburb of Cremorne in 1943. Her student son, Noel Thompson Drane gained the degree of Bachelor of Economics at the University of Sydney in 1951 and later became Professor of Economics at that university and later, Macquarie University. Mrs Elva Drane died on 1 September 1983 in Sydney.